FWE has everything prison foodservice operations need to run more efficiently and effectively. Join FWE at booth #213 this week, at the Association of Correctional Food Service Affiliates (ACFSA) International Conference on August 10 – 14 in St. Louis at the DoubleTree Union Station. Feeding inmates 3 square meals a day is just one of the many concerns a correctional foodservice director has. 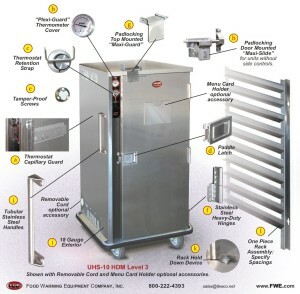 Food Warming Equipment Co. (FWE) has been doing “hard time” under tough conditions providing solutions to correctional foodservice directors for decades. FWE has an established record and reputation for meeting the needs of very special requirements in the most secure and demanding environments worldwide. With Correctional and Prison foodservice solutions custom designed or ready to order, FWE partners with the best experts and nationally recognized dealers like Federal Supply and Cooks Correctional (among many others), to address exactly what you require and allow you to operate under unique conditions. Our consultants and partners have extensive experience working in the correctional environment. Inmates are often entrusted with the operation of equipment in the kitchen so durability, safety and security are significant determining factors in selecting equipment. Tamper-proof correctional packages are needed to meet the safety requirements of this unique environment. The Heavy Duty Modified (HDM) Prison Security Package* is a custom feature that is not just the same old hot box with a few new components added to a standard catalog item. HDM Security Packages represent a complete retrofit from top down, including heavier gauge stainless steel used throughout the body, a retooling of all exposed hardware, and components specific to holding of product for transport. With Several levels of HDM security packages available FWE has many customizations for your specific correctional foodservice challenges and requirements. With ultra heavy-duty construction and tamper resistant features throughout, they are designed and built for the harshest conditions. For well over a half century FWE has been providing “correctional quality” equipment for prisons, penitentiaries, penal institutions, and jails of all sizes and security levels. FWE mobile food transport and heated holding cabinets can exceed all your requirements for reliability, usability and safety. FWE heated holding and transport solutions are serving tens of thousands of inmates worldwide. From local county jails to rehabilitation centers in Hong Kong FWE delivers the right solution for in every type of environment imaginable. Everyone knows that FWE has the toughest, most durable, maintenance-free foodservice transport solutions for the correctional market. FWE is known as an industry leader in providing solutions to the correctional market. FWE works directly with known, reputable consultants and dealers with decades of experience and a solid reputation within the correctional market. At FWE It’s all about you. j) Exterior: 18 Ga. Interior: 20 Ga.